Preacher are an Ayrshire based original melodic rock band that formed in 2007. "I came to Ayrshire and I heard Ayrshire rock! It was brilliant and I absolutely loved it"(Greg Kane. Hue And Cry) "Hints of mid era The Who, The Stranglers and Pearl Jam pepper a big sound"(King Tuts) "Preacher were the surprise band of the night. Hailing from Ayr,these five rockers were absolutely brilliant. Martin Murphy has a tremendous voice and certainly knows how to work a crowd even though was a relatively small crowd. I was also very impressed by Shug Gibson on guitar and Davy Johnston on bass. I believe these guys have only been together as Preacher-Rock-Band for a relatively short time but they are all seasoned musicians and it certainly showed on the night. If you get the chance to catch these guys play live then I can only recommend that you do so"(Allan Bannerman - Powerplay Magazine) "Impressed from beginning to end" (Observer) "Preacher started the evening in good stead with a tight set of blues-tinged progressive rock. Impressing as much with their songs as with their delivery, this Ayrshire quintet clearly know the game well. Fine melodies and confidence make for a likeable performance, after all. On a different note, saying “I’m off to see Preacher” sounds good to Christians. Little do they know, huh? "(Peter McGee - Bluesbunny Independant Music Reviews) “Where have this band been!" (Daily Record) Ah! at last, some old heads with young hearts going somewhere. PREACHER rock band comprising of five experienced musicians with complimenting qualities- hopefully a great formula for success. 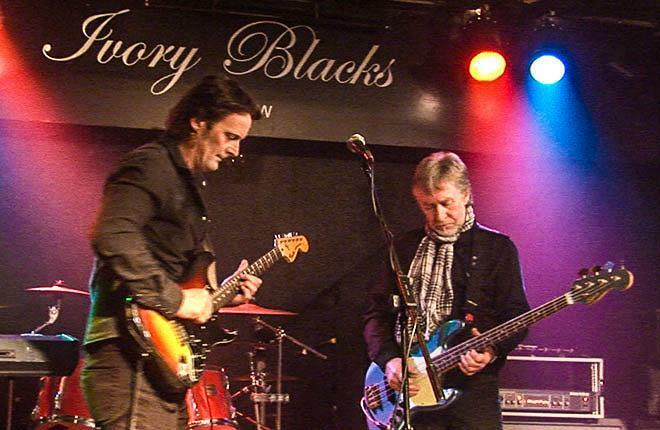 Arnold Burgoyne – Keyboards Ex Echo and the Bunnymen Shug Gibson Lead guitar and backing vocals Ex Peat Loaf and Jeopardy Martin Murphy Vocals, Rhythm Guitar and songwriter Ex Slipstream Greg Murphy-Bass guitar P Jay –Drums and percussion. Preacher formed in 2007 and have been gigging for several years. We have built up a considerable fan base and have played to sell out crowds several times at the likes of King Tuts, The Glasgow 02 and other well known Scottish venues. Our music is timeless with touches of Pearl Jam, The Stranglers and The Who peppering the big sound. We spend a lot of time working on dynamics and we have had great feedback from audiences ranging from 16 to 50 years old and beyond. To date the band have enough live original material for several hours and are selective about what set they play to satisfy the age of the audience and also the venue. We are currently recording our first album with the help of Jim Prime Decon Blue on production and are also recording a song with blues legend Arthur Louis which Frankie Miller wrote for him. Melodious rock with a lot of feel and meaning is what we are trying to achieve and with five good ears in the studio the album in progress is developing into something great! Our album is due for release early 2011 The band are always offered repeat gigs so we must be doing something right. We are writing new music more quickly than we can record at the moment and hope to take a couple of months off later in the year to complete our album.